This is a short introduction to Years of Decay. It will provide you with general instructions on how to set up the game and to start playing. If you have a specific question, or if you would like to get detailed instructions, please see the manual for reference. (Related pages: Newcomer's Guide, Starting Out Guide. To play Years of Decay you need to create an account first. Simply click on create account and follow the instructions. Once you have entered your Account Number, Password, Real Name, Location and Email Address click the Create Account button. Memorise both the account number and the password carefully or write them down. As a next step please download the client software and install it on your computer. Once Years of Decay is installed you have to create your first character. Click on "Login" on the left hand side of the website under the banner and enter your account number and password. After pressing "Login", you will see your account page. Scroll down to the OPTIONS: section and click on the "Create new Character". Select your character's name, vocation and gender. Please make sure that you choose a name for your character that does not violate the Years of Decay Rules. Of course, you have to follow this code of conduct while playing and using our website at any time. Otherwise, you may be excluded from our game service. Now you are ready to start playing. Go to your windows desktop and double-click on the YoD icon to start the game client. On the title screen simply click on "Enter Game". Once you have entered your account data a menu will be displayed. Double-click on the name of the character you have created. The client will now connect to the game server and your character can start his career as an adventurer. Please note that if too many players are online on the server, you will have to wait a while before you can log in. The client will show your current position in the login queue and automatically try to log in your character after the displayed waiting period. 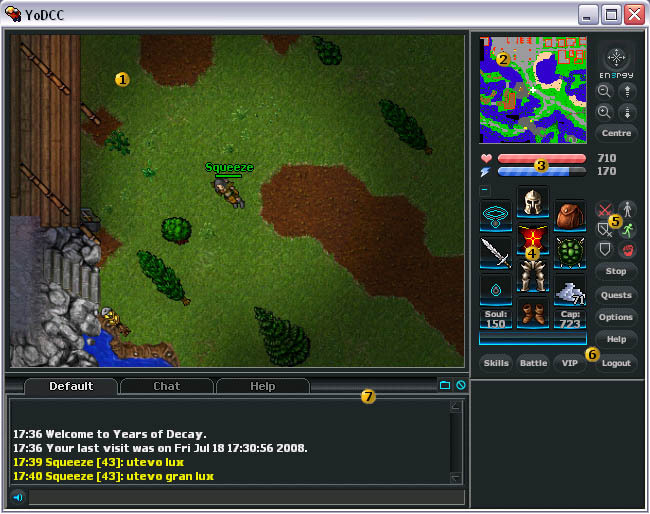 The game window is where most of the action is taking place. It shows a part of the world of Years of Decay, with your own character in the middle. Much like a radar screen, the automap will show you an overview of your surroundings. In the beginning a large part of this map will be dark since you need to explore the area first. The map buttons to the right will allow you to scroll around on the automap. The status bars show your current hit points (red) and magic points (blue). Right below these bars you can see your inventory. It is divided into several slots for different body parts. Please note that you can put items only in the slot they are designed for, i.e. you can place a shield in your character's hand, but not on his head. The top right slot is reserved for containers such as bags and backpacks. The combat controls consist of six buttons. They determine your character's behaviour in battle. Several further buttons are arranged next to or below the inventory screen. Some of them ("Options" and "Help") will open up menus, while others (such as "VIP" and "Battle") will open up sub-windows. Clicking on "Stop" will cause your character to stop any action he is currently taking, while the button "Logout" will end the game. At the bottom of the screen you will find the console through which you can talk to other players. Communication is organised in different chat channels which can be activated by clicking on the little button with the file card in the top right corner of the console. You will start your adventure in the Priida Temple. Simply left-click on the spot in the game window you want your character to go to or use the arrow keys. Walk around for a little while and a second tutorial hint will appear explaining how to move your character by left-clicking on a mark on your automap. You can also add own marks to the automap, e.g. to remember the entrance to your favourite dungeon, to find a special NPC or to mark the way to your own house. In the Priida Temple, at the rear, is a statue. Right-click on it and a context menu will open up where you can read "Look" or "Use", select "Use". You will have just received your starting equipment and completed your first quest. Depending on the characteristics of an item, the context menu will vary, e.g. you can "Open" boxes, or "Rotate" a chair. A context menu will also open up if you click on a character or on an NPC. Right-click on Soraya in the Temple and a context menu will open up in which you can select several options such as look, use, follow and even attack. But then, surely you would not want to attack a peaceful lady like Soraya! She is a friendly lady who enjoys helping newcomers to make their first steps in Years of Decay. You should talk to her by entering hi or hello and hitting the enter key. NPCs in Years of Decay react to keywords. So simply answer her questions or try using using different keywords to continue a conversation (eg. 'help'). Quests are jobs or tasks that inhabitants of Years of Decay have for you. Of course, Soraya will send you on a very easy and basic quest if you ask. If your character gets stronger, also the quests will be more difficult and challenging. You should really take the time to talk to the inhabitants of Years of Decay. You will learn a lot about the fascinating world you are playing in that way. Simply greet them and ask them about general things such as their job or their name. With a bit of luck, they will also have some job for you - simply ask them for a mission or a quest. If you complete their quest, they will reward you with useful items or with valuable information. If you "Use" the sewer grate outside the Priida Temple you will find yourself in a cave with rotworms. Do not panic, rotworms are fairly harmless and provide good food and experience for the newcomer. You will find out that most creatures are aggressive and attack you on sight. Easy monsters to start with are rotworms. The sewers of Priida are infested with them. Once you have killed a rotworm, you should right-click on its corpse and select "Open". With a bit of luck you will find some gold pieces and some food. To take items left-click on them and drag them onto the bag in your inventory. To check the contents of your bag right-click on it and select "Open". Please note if more than one character obtained experience points for killing a creature, only the one that made the most damage will be able to loot in the first 10 seconds after the kill. During this time it is also impossible to move the corpse. If a character has joined a party, every member of this party will be able to loot the dead creature. Of course, nobody wants to stay in a sewer full of rotworms forever. If you have collected enough gold, it is a good idea to head back to the surface and buy some equipment. Go back to the rope spot you came down on when you entered the sewera. To get out, right-click on your rope and select "Use With…" and then select the rope spot on the ground with the cross-hairs. Usually, experience points are obtained by fighting aggressive monsters. If you have gathered enough experience points, your character will advance in level, which will make him faster and stronger in a number of ways. In addition to his experience your character also has skills that determine how well your character can fight, fish etc. You will improve these skills simply by using them. To check out your current experience level and your skills click on the "Skills" button beneath your inventory or press the key combination Ctrl+S. Your first aim should be to make your character as strong as possible. The village of Priida and its surroundings are exciting places filled with secrets and adventure, but you should be wary - there are worse monsters in Years of Decay than rotworms! If you don't know which creatures are best to hunt for your level, talk to one of the other players. Try to collect as much experience as you can. Also, you should save money to get the best equipment there is. Also, make sure to always have some food with you. If you have been injured in a battle, eating will slowly refill your character's hit points and mana. If you are seriously injured or poisoned, use a magic spell, rune or potion to restore your character. Don't be too frightened to go out and to explore! Soon, also killing a rat will be a trifle and, frankly, a bit boring, so you should move on to meet new challenges. Remember the worst thing that can happen to you is death - and death, thankfully, is not the final matter in Years of Decay as it is in real life. If your character gets killed, he will reappear in the local temple safe and sound. However, there is a penalty for dying - your character will lose experience, skills and probably some items as well. Once you have saved a bit of money you should invest in better equipment. Try buying better equipment from the NPC's or other players. You will find there are many other players around, and surely some of them will be happy to trade with you! To talk to other nearby players enter any text in the default channel and hit the enter key. You can also message players directly by right-clicking onto them and selecting "Message to" and the name of the character. This will open a channel where you can talk to this player in private. If another player agrees to trade with you, you can do so by using a special trade mode. Simply place your character next to the player you want to trade with. Right-click on the item you would like to trade and select "Trade with …". The cursor will turn into crosshairs. Now all you need to do is to click on your trade partner. Your partner will now see the offer, and if he agrees to trade, he will offer another item in exchange. If you are satisfied with his offer, click on "Accept" to complete the deal. If you want to trade several items at once, put them into a container and offer it to your trade partner. Please note that you always should use the logout button to quit Years of Decay. If you are not allowed to log out immediately, it is likely that you have recently been involved in fighting. The so-called logout block ensures that you cannot escape from a challenge in an unfair way. Remember if you simply shut down your client, your character may stay in the game even if your computer has been switched off. This can be very dangerous so always log out properly in a safe place. If you have questions concerning the client controls, general game play, the use of accounts or the official website, there are many different ways to get help. For example, tutorial hints will supply you with useful tips as you go along. This means that either a new window will pop up explaining the handling of a certain function, or a certain part in the adventure screen will be marked. Also, you can activate the client help by hitting the key combination Ctrl+H. The client help will give you detailed information about the parts of the client and special items in the game window. If you have specific questions, you should have a look at the FAQ and the manual on our website. If you do not find your answer here, you can use the help channel in the game. Simply press the key combination Ctrl+T and ask your question. Our tutors will be happy to help you. However, please note that tutors are not allowed to answer questions concerning game content such as quests. Finally, if you find out that the Years of Decay Rules have been violated, you can report it to the gamemasters. To do so press the key combination Ctrl+R. Years of Decay gamemasters are busy people, so you should make sure your report is really referring to a rule violation. Be wary when exploring your new surrounding because other players can attack and even kill your character! It is a good idea to stay out of trouble, so you should be friendly and avoid insults or provocations. If you see a player who is marked with a little skull mark underneath his name, you should be careful because that player has recently been involved in violence. If you should run into trouble, remember protection zones such as temples or depots will give you shelter until the storm has cleared. Of course you should not only be respectful towards other players to avoid trouble. It is also a question of fairness. Therefore you are expected to follow the Years of Decay Rules. Whatever you do, you should always try to make the best of your character's vocation. There are enemies on other continents the like of which you have never seen in Priida, so you better make sure your character will be strong enough to face the challenge! It is a good idea to stay close to the safety of your home city for a while, but you should not do so forever. Remember there is a whole continent out there for you to explore and to conquer! From the dwarf-ridden mines south of Priida to the lurking horrors of the Farplains, from the awe-inspiring minotaur fortress at Minshore to the fierce dragon lords atop the peaks of Mount Kathleen, Years of Decay is a thrilling world filled with mystery and adventure. Are you ready to take on the challenge of Years of Decay?